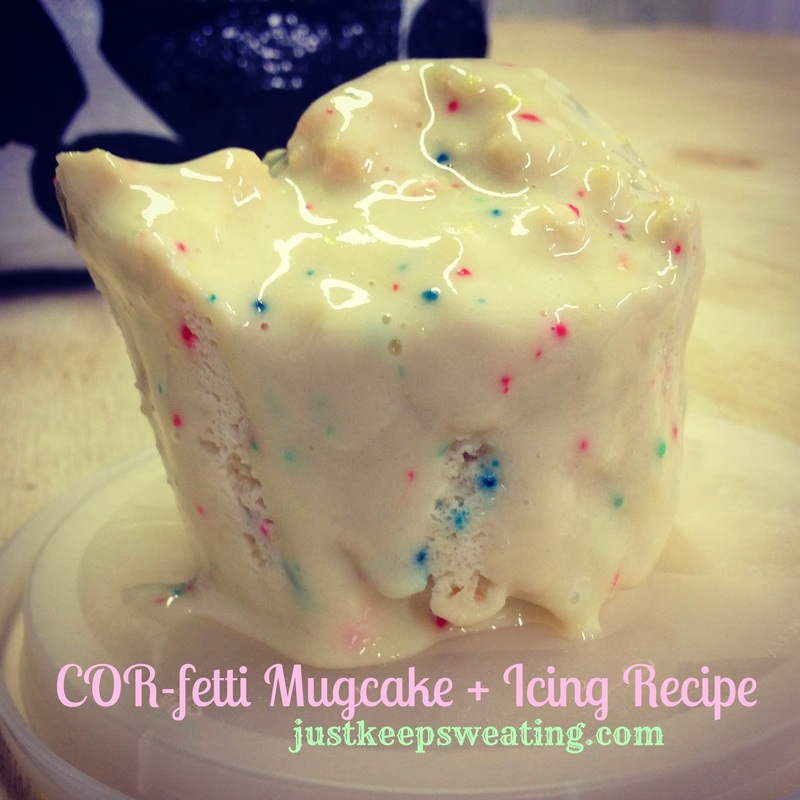 Just Keep Sweating: COR-fetti Mug Cake Recipe! Started my birthday week off with a green smoothie and some snow. In the jar: Kale, Spinach, Frozen Mango, PHresh Greens and Chia Seeds! This week I am really trying to regain my focus for clean, healthy eats and I brought what felt like a suitcase to work full of my meals and snacks. One of those snacks was the ingredients for this beautiful little mugcake. In sixty seconds or less you have a delicious, protein packed snack that won't derail you from your weight loss/ healthy eating goals! After work I crushed my legs and biceps in the gym to the point I was having trouble holding my phone to talk to Eddie afterwards. I was so tired that I kind of phoned it in when it came to dinner. There was leftover veggie fried rice from the night before with two over easy eggs on top. It was surprisingly delicious and something that I may have again in the future. Yesterday was a great start to the week full of good eats and lots of sweat. That mug cake looks SO good! :) Thanks for sharing the recipe! The mug cake looks amazing! I miss my green smoothies...it just so cold I don't want them in the Winter but I have to get back to them too. This recipe sounds yummy! YUMMM on the mug cake! Sounds delicious!